While the Academy Awards are predominately about celebrating motion picture achievements, they are also well known as the biggest fashion night of the year. Simple, elegant and classy, our favorite celebrity moms rocked the red carpet in some incredibly beautiful designer gowns. We have rounded up our favorites. What did you think? Charlize Theron walked the red carpet in an amazing white Dior gown, but changed into a creme flowy dress when she performed a dance number to “The Way You Look Tonight” with Channing Tatum. The actress later returned to the stage with Dustin Hoffman to present the award for Best Screenplay. Dazzling in a Versace gown, Halle Berry later appeared on stage to honor the James Bond franchise. Adele was beautiful in a black beaded Jenny Packham gown, which weighed a whopping 30lbs! When she performed her Oscar nominated song, ‘Skyfall’, she appeared to be wearing a similar looking dress, but much shorter(and likely lighter)! It is her year because she added an Oscar to the collection of awards she has received this year. Reese Witherspoon dazzled in a beautiful blue Louis Vuitton gown that her daughter Ava helped her pick out! 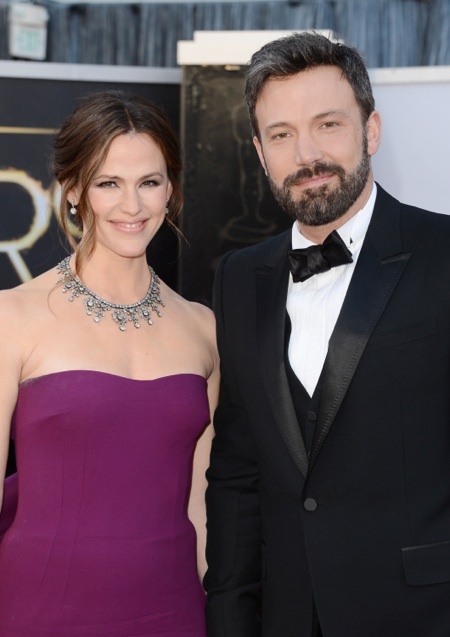 Ben Affleck and Jennifer Garner walked the red carpet hand in hand both wearing Gucci. The actor/director was nominated as a producer for Best Picture for his work on Argo, for which he won along with George Clooney & Grant Heslov. Ben also presented the award for the best documentary feature. Jennifer and Jessica Chastain presented the award for the Best Foreign Language Film. 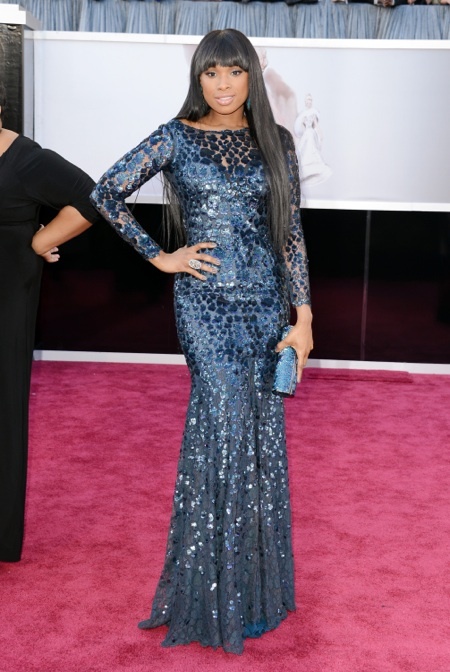 Jennifer Hudson walked the red carpet in a Roberto Cavalli Couture dress. She performed “And I Am Telling You I’m Not Going” from Dreamgirls, the song that won her an Oscar in 2007. While dressed in a beautiful Elie Saab gown Sandra Bullock presented the award for Achievement in Editing. Please visit our Gallery to see our other favorites!